Character Options has long been synonymous with quality Doctor Who products. Fans of Who have come to know that Character Options name on a product usually means high quality merchandise. Thankfully the company's new line of Doctor Who toys build on that reputation. 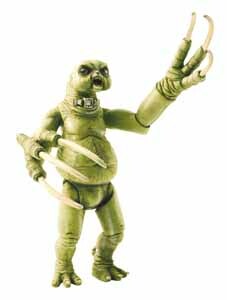 The Slitheen action figure is a pretty mean looking beast and comes with nine points of articulation (head, shoulders, elbows, hips and knees) and scary looking claws. Its face is frozen in a grotesque scream and its eyes are dark red - almost black. 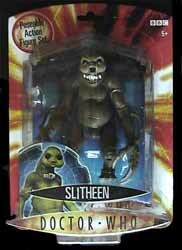 For such a low price point, this action figure is well detailed and will find pride of place in any young child's toy box, or serious older fan's collection. Whether you are buying this to play with, or display in it's packaging, you can't go wrong with this toy. But be warned though - it's a scary looking monster. Sad to say that even though I'm in my thirties I was tempted, momentarily, to hide behind the sofa once again.